Last view: 2 hours oh yea, your very welcome by the way (from the top main post) about the mmc5 stuff. that's "almost" the exact same reason i was in the credits for puresabe's rockman 4 minus infinity as "cart information"
I'm in Level 1 dungeon right now, and although I'm near the end of it, there are still a few more rooms I want to check, so I can cross them off the map there, but I ran out of the magic meter. Is there anyway to replenish it other than defeating the dungeon? Find the old man with the bottle and the woman at the counter in south hyrule will open up a potion shop. I'd just like to let everyone know about the Lantern. I understand the frustration of using it in multiple dungeons. But there is an alternative to that, and it's the Red Lantern. If you really hunt for it within the Light World, you can have this in your inventory before you start Level-2. If you are unable to find it, pay the old woman by Link's house to have her give you a hint. Pay very close attention to the words she uses. Last view: 45 days Infidelity... Why are the LA moblins still in this ROM? I designed for you moblins so please use them. Is that too much I am asking you for? Edit: As of version 1.33. Where is the dungeon item of Level 2? Edit2: Nevermind I found it. Last view: 12 days Ok, there will be another beta, v1.4. I have (on my laptop) completed a thorough play through of all dungeons within the game. There were more bugs discovered, and now they are all fixed! 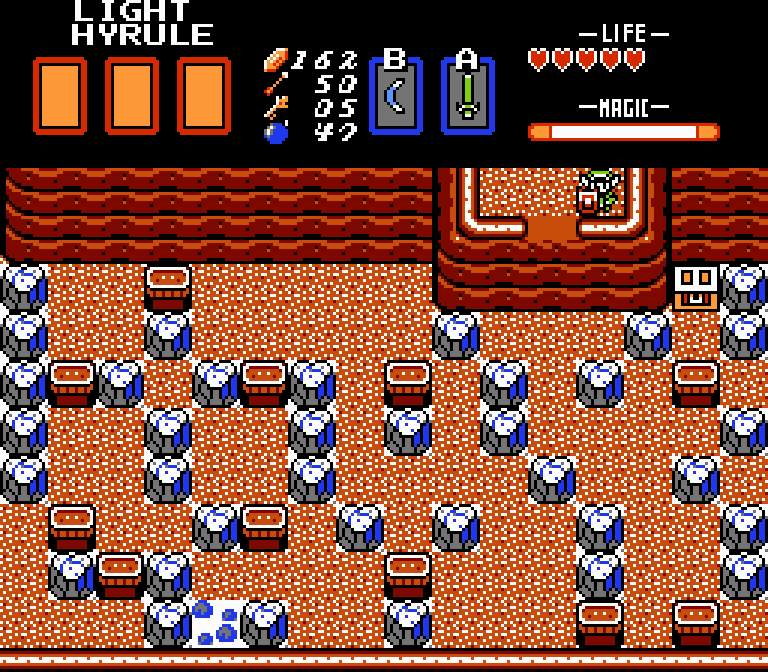 I was able to obtain all dungeon items, all triforce pieces are correct, all maps and compasses are correct, all SRAM is now correct. I extremely apologize for everyone playing multiple times. Before I release the v1.4b, I need to update the moblins at Thanatos's request, and then I'll release it. I might be able to get this all possible tonight. Ok, there will be another beta, v1.4. no need to apoologize just compensate us on investing in your main project. Joke aside though I'm taking my time, I haven't even gone back inside dungeon 1 I ran across a week ago. If the mmc5 music wasn't in your hack I would play it on my 3ds. Could someone compile that emulator please ? I'll paypal you 7.00 bucks if I see it working, I don't have the programming knowledge to do this otherwise I wouldn't ask. Last view: 1705 days I have made a build called nesdsv1.3b_fixed - it should be available on the site FileTrip. Last view: 12 days Can you submit me the direct download link for it? I'll paste it on the front page of working emulators. Last view: 1705 days Sure - I'll supply a direct link when I am at the office tomorrow (if nobody beats me to it). I can verify that the intro works just fine and I have played up to the second dungeon without any problems on the latest available patch of z-lol. Thanks again infidelity - for a wonderful hack!! Sure - I'll supply a direct link when I am at the office tomorrow (if nobody beats me to it). Sweet I have it downloaded I'll put it on my card and get my kodak ready to record tonight. Infidelt should I host the video link in your thread or my other thread ? Last view: 12 days I have a new beta coming out hopefully tomorrow. with v1.4, I played through all dungeons with no issues after my fixes. I'm truly confident in the stability of v1.4. v1.3 does have bugs and crashes, but this 1.4 I'm working on, is the absolute best, no glitches, no crashes, and, I've made a new feature which I hope everyone will be pleased with, spent all afternoon/evening on it. I just need to insert Thanatos's updated sprites, most likely tomorrow I'll get to it, and then v1.4 will he immediately released. Last view: 1157 days I've played through 3 dungeons so far. Just a few minor glitches I encountered, only one of which I managed to nab a screen shot of. While I was playing, I noticed a few staircases randomly pop up where they weren't supposed to. This happened along the bottom center of the map, along the shore. I've noticed you can get secrets over again, especially after you die and continue, or have spent a long time exploring. This happens with the first sword and boomerang as well, meaning you can permanently lose the master sword. I streamed this on hitbox but it didn't save my gameplay video for some reason, so I can't link to a video of it just yet. Last view: 12 days If you can recreate this SRAM glitch, it would really help me out. I'll take care of that mountain area, good find, thank you! Again on that SRAM issue, if you can recreate that, it would really help me out. However, in v1.4 I'm working on, I discovered incorrect portions of my outworld being loaded/stored into SRAM when completing the light world, and its all fixed. Last view: 45 days I have edited now the hammer Infidelity. Please look into the dropbox. Last view: 12 days Thank you Thanatos. Last view: 1647 days I don't know if this was fixed in 1.3.3, but whenever I enter one of those multiple staircase rooms, the screen turns black, and you only catch a glimpse when you warp. Last view: 87 days I didn't get that far playing into the latest beta v.1.3.3, simply because of lack of time, so I'll just wait for the next beta. Sorry if I sound slurred abit, my mother woke me up at 12am halfway dead to the world. I was working yesterday and apparently the place where I work at part time wore me out again. I remembered I made you a promise and some others I mean to do. I may just mute the video but then you wouldn't be able to hear your game. Give me a few days and I'll sift my way through your hack and show some more footage. Last view: 12 days Thank you for the video, looks and sounds awesome! I kept wondering and wondering, why I was getting reports of people saying Link's house would be reset when returning. I've taken care of every aspect of swapping in and out my 80 bytes of portions of the entire light/dark world of Hyrule...... Except for the friggin warp caves! Everything else I was doing is put on hold for now (which is basicly an overhaul of the Hammer) and I will get to this issue asap! Thank you to all for reporting, this one is a major one, but I can assure you, it's the last major one, because I have every angle covered on the SRAM. MySQL - queries: 106, rows: 147/0, time: 0.133 seconds.